Which juicers give the best bang for the buck? When some people hear the word “value”, they automatically think “cheap”. But as the above definition shows, good value really means getting a good return for your money. I recently was in the market for a new smartphone, and did a lot of research looking for the best value. I knew what factors were important to me: solid construction, high quality display, speed, good camera, regular system updates, price. On one hand, I could achieve those goals with a $1000 flagship phone. On the other end of the spectrum, I could spend $150 and compromise on many of those factors. In the end, I found a smartphone around $400 that met all my criteria. For my needs, it was a great value. It’s the same with juicers. Spending $1500 can get a juicer with features like stainless steel construction, industrial-quality motors, and other high-end features. On the other hand, $150 can get a basic Chinese-made slow juicer made with the cheapest possible materials. For most people, neither of these extremes represent a good value. A $1500 juicer is overkill for many consumers, while a $150 juicer is so compromised in performance and build quality it will either break without very gentle use, or end up stored in a cabinet and not used regularly. This article looks at those juicers we consider to be the best value. These are machines we recommend to our friends and have a great performance to price ratio. 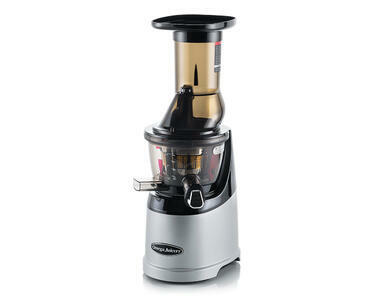 Looking a bit like the Sana 707’s little brother, the Vidia SJ-002 gets our nod as the best value juicer on the market. 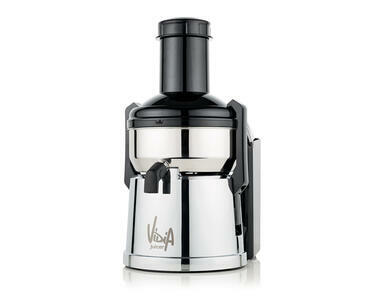 Priced about 100 euros less than the big name juicers, the Vidia features similar performance and quality. This isn’t surprising, since it is made in the same South Korean factory as some of the top juicers. Even at a value price, it comes well-equipped with things normally found only in high-price juicers, including a pulp regulation control, homogenizing screen, and pasta making set. While it doesn’t offer the amazing warranty and accessories as the Sana, we found the performance to be comparable. 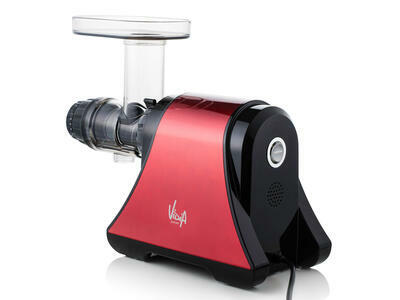 It’s usually the first juicer we recommend for people who want to step up from the cheaply made mass market juicers. Sana juicers always impress with their European design and premium quality. The 707 raises the bar by including the best accessories we’ve seen, including a stainless steel pulp container and a heavy duty glass juicing bowl. In addition, it comes with three juicing screens: a fine screen for most produce, a coarse screen for softer fruit, and a homogenizing screen that crushes and mixes without juicing, allowing it to make things like nut butter, fruit sorbet, pasta, and more. Built like a tank, the Sana 707 seems almost unbreakable. Sana seems to agree, as the 707 has one of the strongest warranties we’ve ever seen. While everything about this juicer feels like no expense was spared, it is priced quite reasonably. 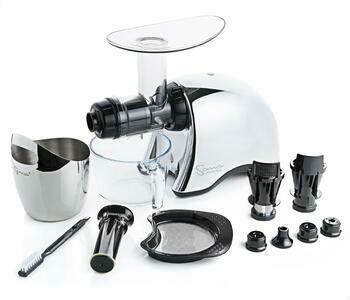 The most expensive juicer on our list, we still feel it represents a good value for the money. The MMV is a second generation wide mouth juicer with great build quality, a powerful motor, and superb ease of use. The feeding tube is probably the easiest to use on the market, and its big auger and strong motor handle most produce with ease. Third-generation wide mouth verticals recently came on the market, but we feel the MMV performs just as well and it costs significantly less than the third gen models. We normally recommend only slow juicers, as the older style centrifugal models tend to be less efficient and can cause oxidation with their high speed motors. However, if the price is the most critical factor, a good centrifugal can be better than a cheap Chinese-made slow juicer. In this case, the Vidia CJ-001 is our pick. Priced around 150 euros, we like the stainless steel construction of all the jucing parts, the large 77mm feeding tube, and the commercial-quality power switch. Also, it has a large pulp container that doesn't require frequent emptying. It is simple to use, and the 500 watt motor is very powerful. One trick to reduce oxidation when using any centrifugal is to add a lemon or lime to the juice when processing – the ascorbic acid in the citrus will greatly reduce any oxidation and keep the juice fresher.